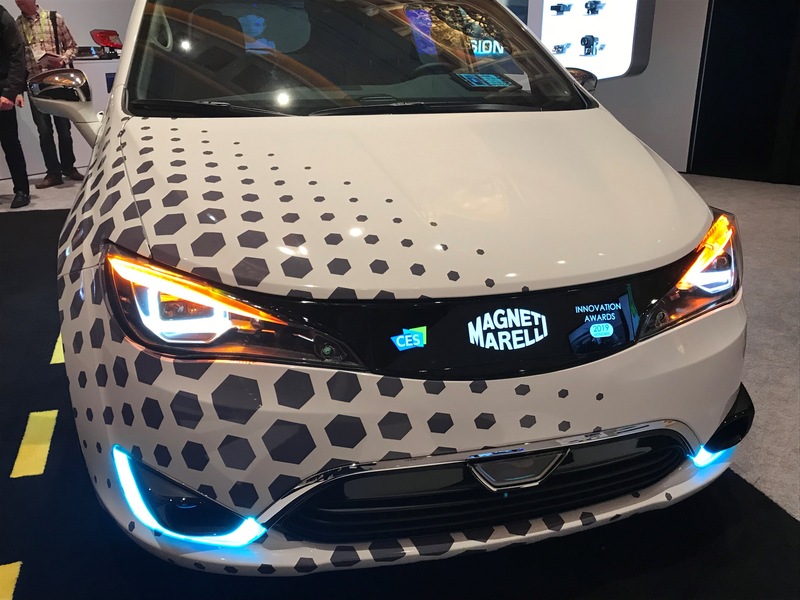 Magneti Marelli is demonstrating its third generation Smart Corner™ – unveiled last week at CES 2019 in Las Vegas – and connected vehicle technology at the North American International Auto Show (NAIAS) during AutoMobili-D in Detroit, Jan. 14-17, 2019. Smart Corner™, named a CES 2019 Innovation Awards Honoree in the Vehicle Intelligence & Self-Driving Technology category, integrates autonomous sensors into headlamps and tail lamps to provide automakers with the required functionality for autonomous driving, while maintaining styling aesthetics and world-class lighting performance. Smart Corner can accommodate any sensor an automaker may choose to deploy, including LiDAR, radar, cameras or ultrasonics, as well as advanced, LED-based lighting features like adaptive driving beam (ADB) and digital light processing (DLP). Smart Corner provides a 360-degree view around the vehicle with redundancy. Because the sensors are integrated into existing headlamps and tail lamps, an automaker benefits from a fully calibrated, plug-and-play solution, resulting in a simplified manufacturing process that’s lower cost and lighter weight than alternatives. As an extension of its Smart Corner concept, Magneti Marelli has developed connectivity features that are seamlessly integrated into a test vehicle that will be on display at NAIAS. Technology includes active matrix organic light-emitting diode (AMOLED) displays embedded in the front grille and rear applique to communicate intent to pedestrians, bicyclists, and other vehicles; autonomous signaling to communicate to others that the vehicle is in autonomous mode; an interactive exterior virtual assistant that can perform commands for the driver and passengers such as opening the trunk or unlocking the doors when approaching the vehicle; positional advertising using V2X that provides targeted advertising, projected onto the windows, to individuals based on micro-location; and high power projection and film technologies to support the exterior virtual assistant and positional advertising functionality to achieve a viewable, high quality image from outside and inside the vehicle. Magneti Marelli designs and produces advanced systems and components for the automotive industry. With 85 production units, 15 R&D centers in 20 countries, approximately 44,000 employees and a turnover of 8.2.billion Euro in 2017, the group supplies all the major carmakers in Europe, North and South America and the Asia Pacific region. The business areas include Electronic Systems, Lighting, Powertrain, Suspension and Shock Absorbing Systems, Exhaust Systems, Aftermarket Parts & Services, Plastic Components and Modules, Motorsport.